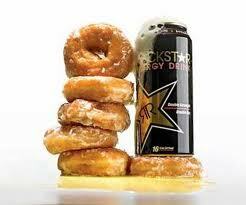 We saw a tweet that said one 16oz Rockstar Energy Drink is equal to six Krispy Kreme Doughnuts. Yikes! We don’t know if this is true, but if it is, is it worth the energy rush? For those out there in cyberland who drink these kind of energy drinks we wish you the best. We have nothing else to report except we are on on way to pick up some Dunkin Doughnuts for later.